In our last post, we looked at Diagnosis-Related Groups and how they receive codes based on cost and complexity. These numbers play a key role in the Case-Mix Index, and today we will look at how those MS-DRGs form the basis of the CMI. scale, say, to determine the next year's budget, they need to have a big picture of the mix of patients - the mix of cases - being treated at the hospital. They need some kind of measure, or indicator, for that mix of patients. 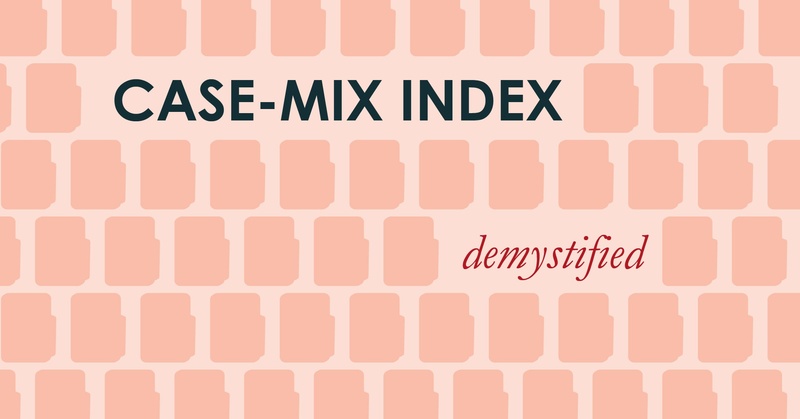 They need the Case-Mix Index. The first step is to translate all the MS-DRGs into a form that allows analysis - a number. As we mentioned in the last post, a relative weight is assigned (by CMS each October) to each MS-DRG. The weight tells you how many times to multiply a base unit of cost - which is determined for each hospital based on a number of attributes such as size, geographic location and type of hospital - to find out the average cost for each procedure. Let's say a hospital's base unit of cost is $5,000 (that number could be lower in a rural hospital, or higher in a big city). A less complex MS-DRG such as pneumonia gets a number less than 1, because it costs less than that base unit of cost (MS-DRG .71, or $3,550). Complex MS-DRGs - like a heart transplant - take a lot of resources, so they get very high weights (MS-DRG 26.2, or $131,500). Now for the macro, big-picture analysis. The CMI is one number capturing all the mixture of cases during a set period of time. It's a rough number, some might say a crude indicator, of what is taking place in the hospital, but it is still valuable. This is how it is generated: Add all the relative weights of each individual MS-DRG assigned during a set period of time and divide that number by the total number of cases during that same period of time. The result is the CMI. The result is a kind of "average MS-DRG," much like a report card grade is a weighted average of scores earned over the course of a quarter, semester, or year. And that's the CMI! In a future post, we'll explore who uses the CMI, and what it can say about your hospital. Stay tuned!